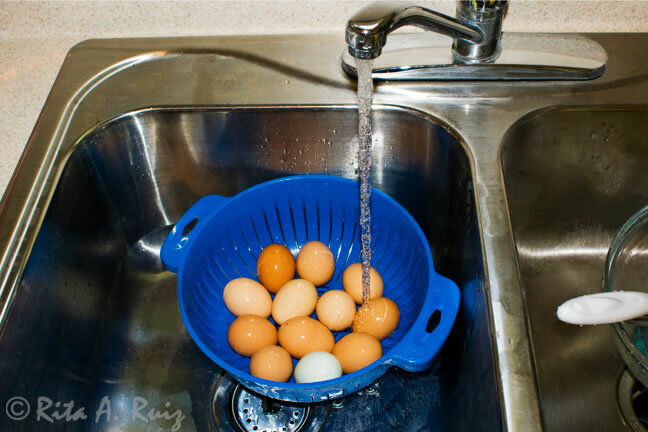 First of all, wash all of your eggs thoroughly under cool water to remove any bacteria and cut down on any possible traces of salmonella. That is the first way you can help to eliminate contracting salmonella poisoning. Just put the eggs in a strainer and rinse under the faucet. 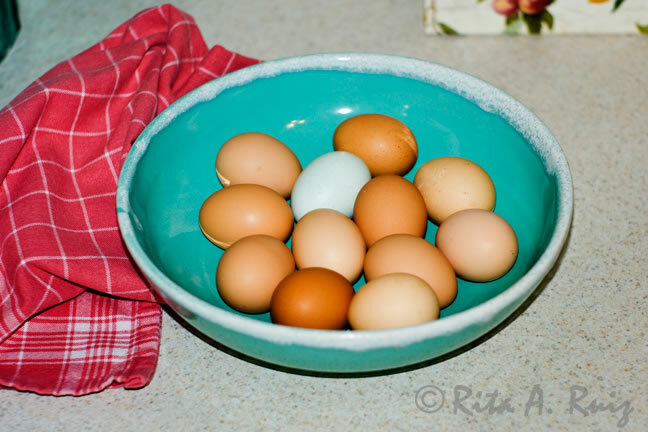 After you’ve washed the eggs, dry them and place them in a bowl for later use. 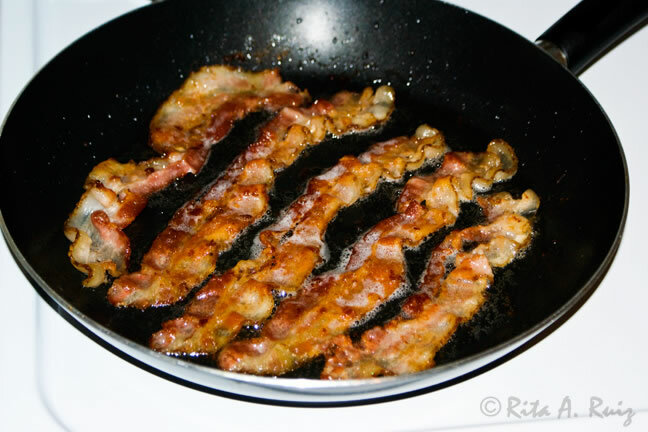 Fry the bacon in a skillet on medium heat until it is nice and crispy. Drain on a paper towel. 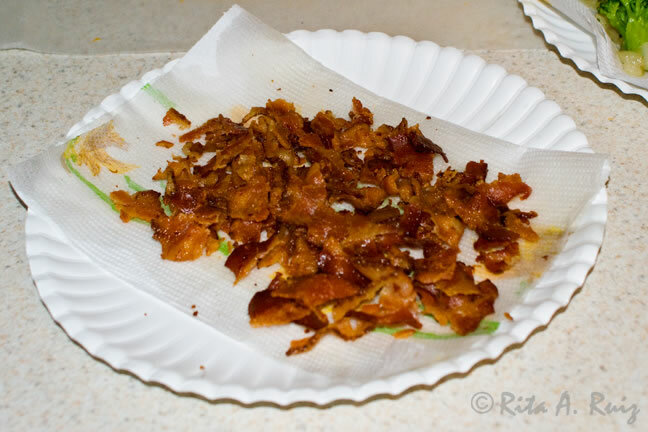 I use paper towels on a paper plate so I can throw the whole thing away when I’m done. Who wants to wash greasy plates? Not me, and it makes for less clean-up. Make it easy on yourself. That’s what this meal is all about! 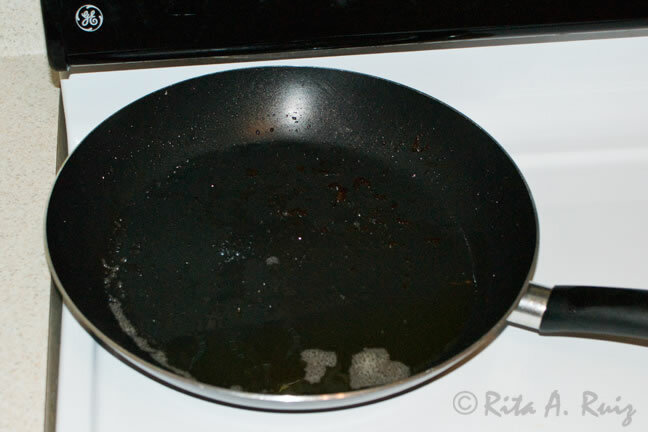 After you’ve turned off the stove, pull pan with bacon grease off burner and move to another burner that has been off. We’ll use this bacon grease in a minute, but it doesn’t need to sit on the hot burner smoking. 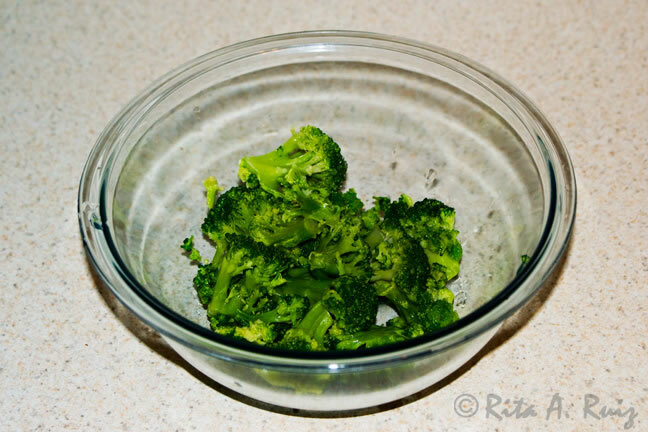 Rinse your frozen broccoli under cool running water in a strainer to remove any ice particles. 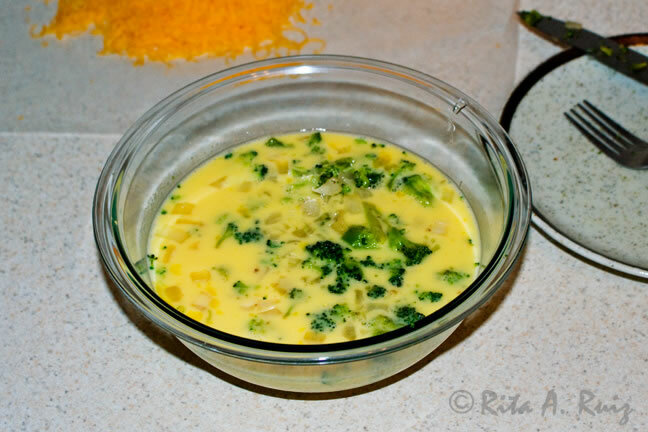 Drain, pat dry and place in small bowl. Dice your onion on a small plate. Slice crosswise horizontally and vertically first. 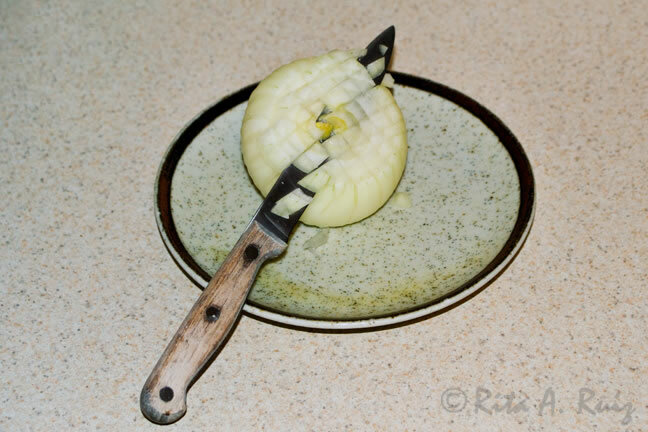 Then slice across the whole onion like if you were making onion rings or just slicing normally. This is just an easy way to cut the onion so it falls right onto the plate already diced. 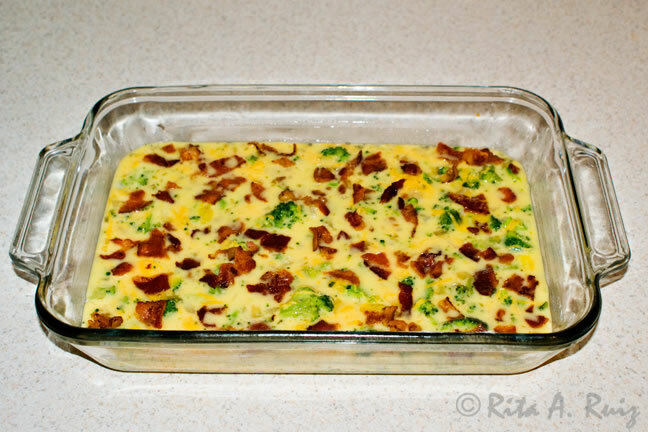 Put that aside with the bacon and the broccoli. Now put the pan with the bacon grease back on the burner and turn to medium heat. 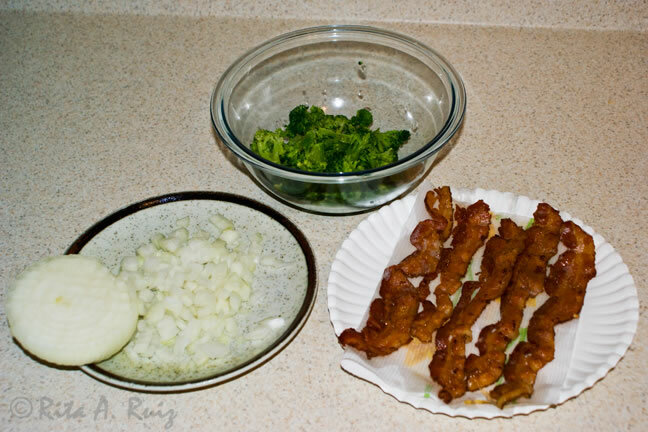 Let it heat back up for a minute, and then add your broccoli and onions to the hot grease. 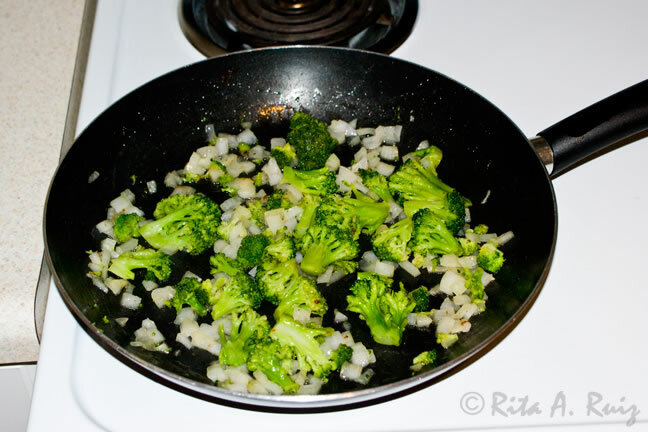 Saute until onion starts to look a little translucent and broccoli gets a little brown from the hot bacon grease. Don’t overcook the broccoli. 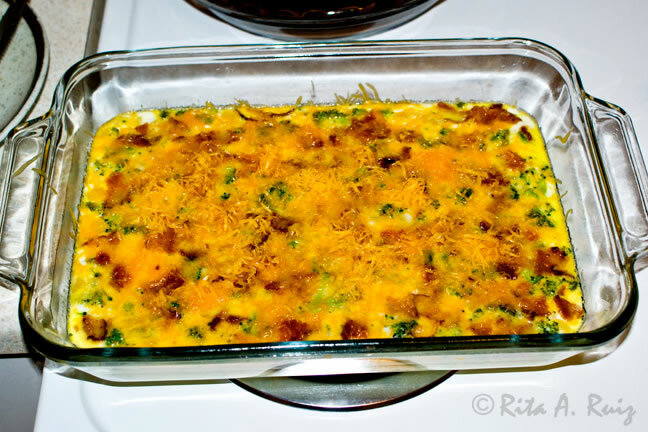 We’re going to put it in the oven and it will finish cooking in the quiche. It should look like this when it’s ready to come off the stove. 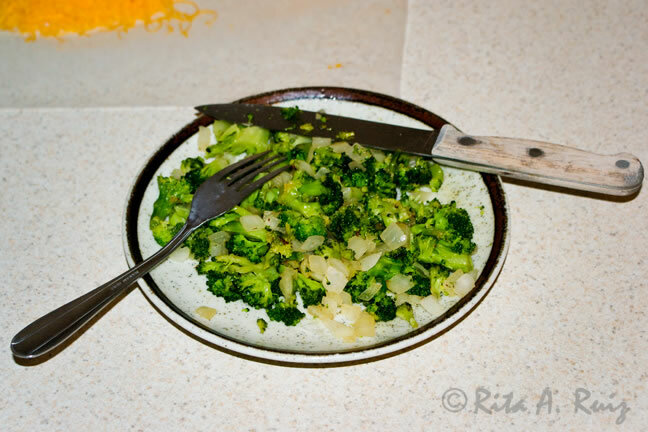 Once you’ve put it in a plate from the pan, cut up the broccoli now into smaller pieces so you don’t have such large crowns that are too big to eat comfortably in a single bite. 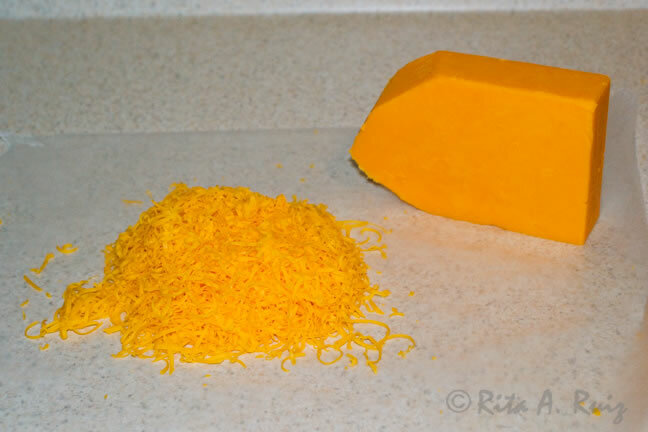 Now grate your cheddar cheese with a grater until you have about 1 1/2 to 2 cups. Preheat the oven to 325. Now it’s time to crack the eggs into a bowl. 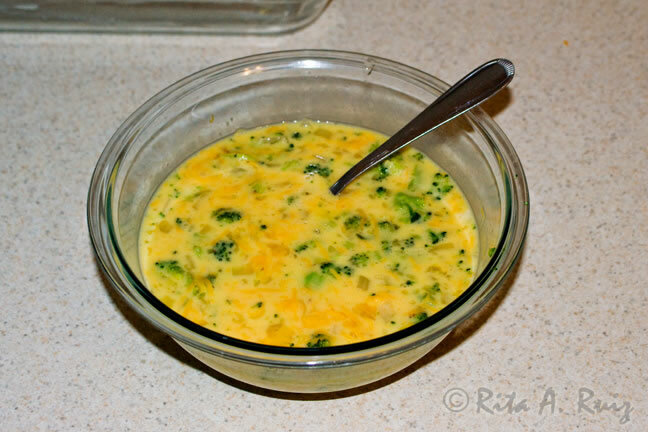 (I just use the same bowl I had the broccoli in to cut down on using too many dishes and making more work for yourself.) After you finish handling the eggs, immediately WASH your hands with soap and water. This is the second way you can avoid getting salmonella poisoning. Removing any traces of raw egg from your hands will help prevent this. 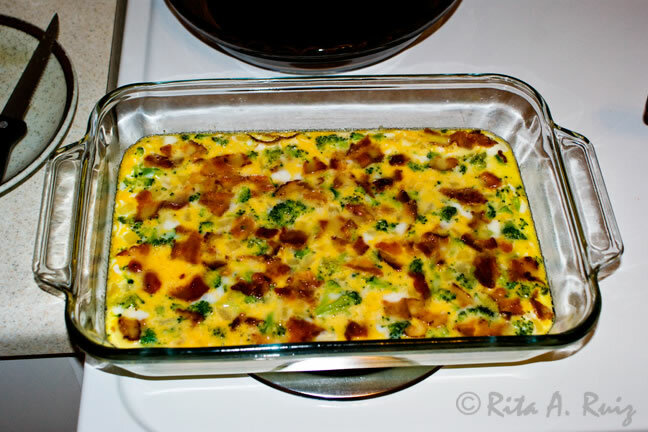 So, now you’ll want to break the yolks and beat the eggs slightly. 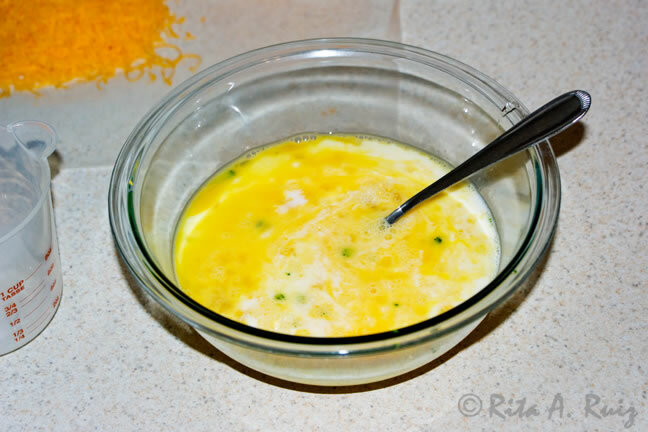 This will make it much easier when you add the other ingredients if the yolks are already broken and mixed up with the egg whites. Otherwise, you may make more of a mess trying to do it after your add-ins. I don’t really measure too many ingredients when I cook. That just comes from experience. So, I poured into a measuring cup what I normally pour into my eggs and then looked to see how much cream I used. This is what I got. I was somewhere just above a third of a cup. I really think if you used up to a half of a cup, you would still be fine. Pour that into your eggs. 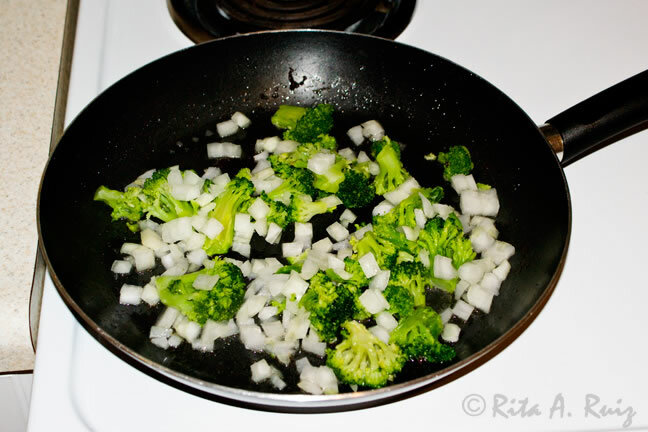 Now add those wonderful smelling onions and broccoli, and mix everything up gently. Also, add your pepper in here. I don’t add salt because the bacon is already salty enough. Too much salt is not good for you and can make your blood pressure go up. 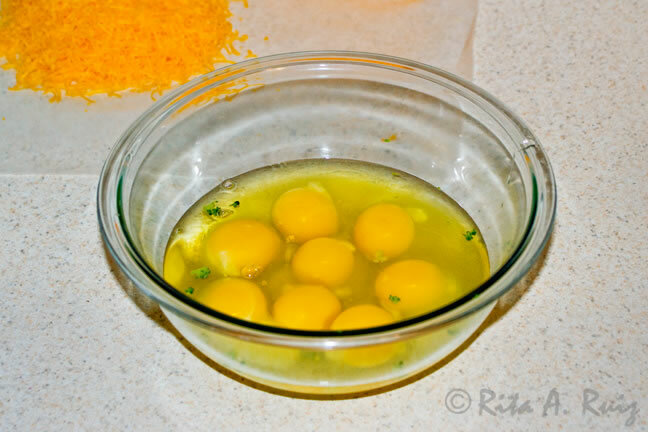 …and gently fold into the egg mixture. 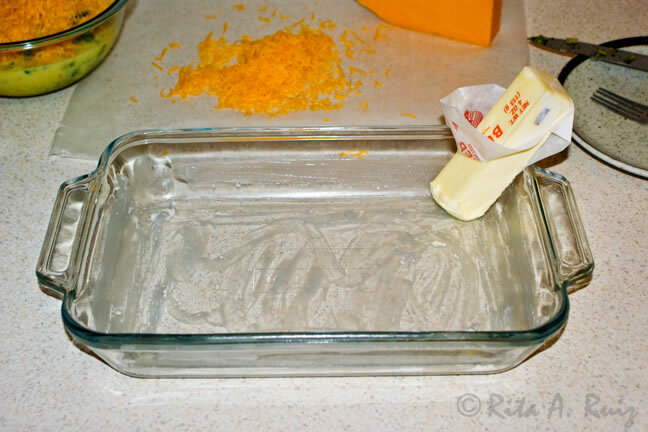 Using your stick of butter, unwrap one end and rub all along the bottom and the sides of your casserole dish. 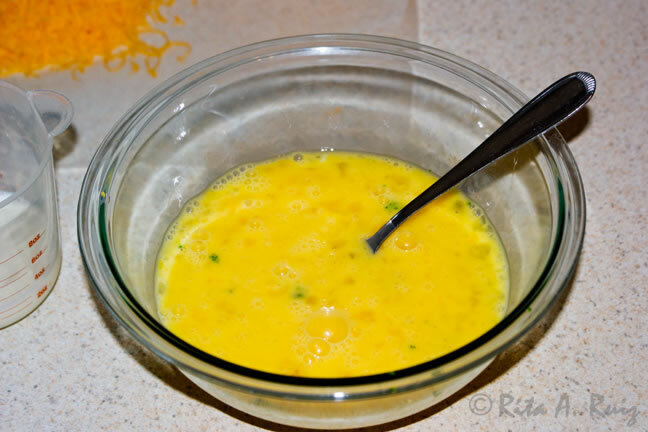 Now pour the egg mixture into the casserole dish. Okay. Let’s add that delicious bacon. Crumble it up into small pieces first. 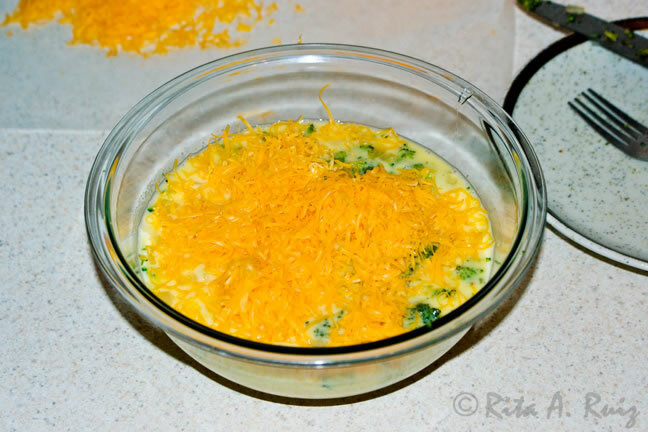 Now sprinkle it over your egg mixture in the casserole dish. 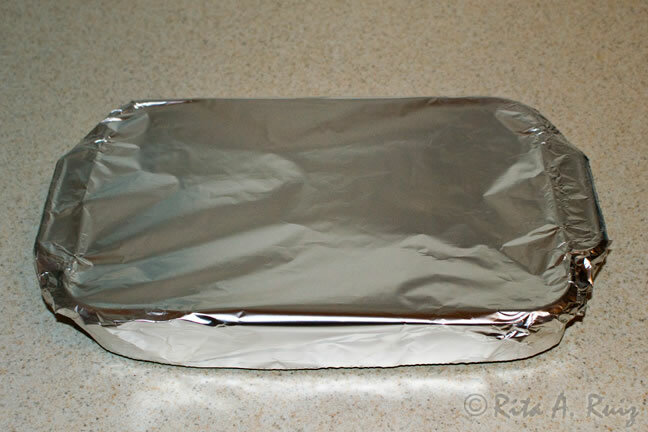 Cover it with some foil and put in your pre-heated oven for about 25 minutes. When you take it out, it should be firm and not still runny. It’s already mostly done, but if it’s not, you can put it back in for a few more minutes and even turn your oven up 25 degrees if necessary till it comes out not runny. Cooking it all the way through so there are no runny parts is the third way to cut down on Salmonella poisoning. 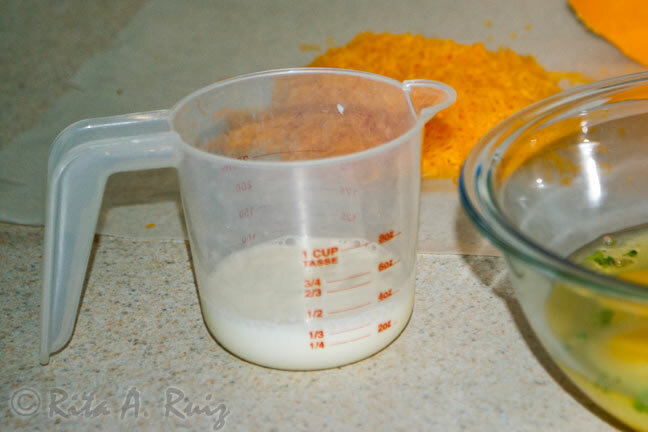 Now sprinkle the remaining cheese over the top so it can melt. It will start to melt already because the contents are hot. Put it back in the oven for another 5 minutes or so. Keep an eye on it, because it won’t take long for it to completely melt. Mmmm…! How delicious looking is that?! 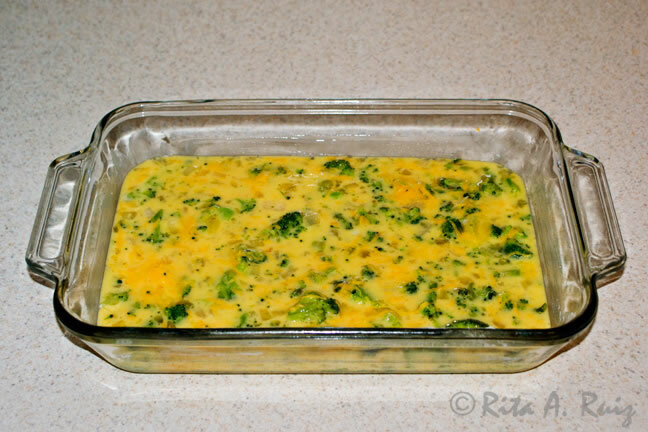 Let it cool slightly, and cut into sections and serve. 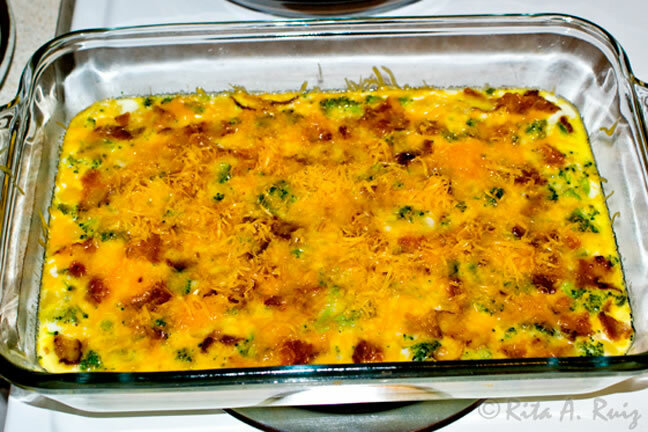 Make some Cheesy Tomato Bread while the quiche is in the oven, put it in the oven when you take out the quiche and cook while it is cooling. The recipe is here https://rtcrita.wordpress.com/creative/cheesy-tomato-bread/ Pour a glass of orange juice for everyone and enjoy your easy, delicious meal with your family!